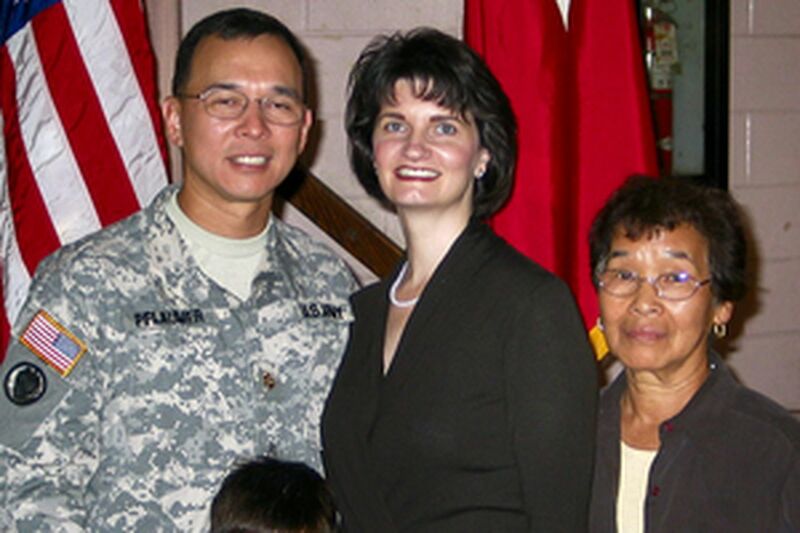 Army Reserve Lt. Col. Jack Pflaumer with wife Lisa, son Andrew and mother Sumiko. In Iraq, he saw needs, and his wife sprang into action. When Army Reserve Lt. Col. Jack Pflaumer arrived in war-torn Baghdad in December, he was touched by the desperately poor Iraqis he met - especially the children. Children at a clinic in nearby Al Radwaniyah lacked clothes, shoes and toys. Infants in Ramadi in central Iraq needed formula, nutritional drinks and bottles. Adults were without clothing and vitamins. Pflaumer, a research scientist for the State of New Jersey, phoned home to his wife, Lisa, in Langhorne, Bucks County, a week before Christmas with an unusual request: Could she start a donation drive to help the Iraqis? Lisa Pflaumer, a former Defense Department logistics manager, sprang into action last month, starting what she calls Operation Iraqi Hope. She e-mailed friends and contacted her 5-year-old son's school, her church, the Girl Scouts, and other community groups. As word spread, Lisa Pflaumer began confidently talking about shipping a mountain of donated items to the poor of Iraq - a goal that puts her living-room charity in the same league with well-organized community groups. "My goal - over the year - is to ship a ton of goods, 2,000 pounds," said Lisa Pflaumer, 37, chairwoman of the Board of Supervisors in Middletown Township. "The soldiers are our ambassadors of good will, but we would like to create a lasting partnership between two countries, two worlds." Other American soldiers have given Iraqis their time and skills. Some have handed out goods that sometimes are provided by their families, friends, local businesses, schools and other organizations. But donation drives on the home front like Pflaumer's - individual efforts aimed at helping Iraqi people - are unusual. "It's unusual in the sense it takes a special individual to get this accomplished," said Col. Kevin McAleese, a spokesman for Lt. Col. Pflamuer's unit, the Norristown-based 358th Civil Affairs Brigade, which helps reconstruct societies affected by war. "It's like starting your own business. You have to get an army of volunteers involved. "For an individual to take it to the next step and set up room in their house and make phone calls and have others make phone calls, that takes somebody creative - someone who has a passion for it. It's not like the federal government is handing her $100,000." As word spread about her living-room collection drive, other collection sites were set up in the lobby of the Middletown Township municipal building and the office of State Rep. Chris King (D., Bucks) in Langhorne. Pflaumer's church, the Lutheran Church of God's Love in Newtown, also pitched in, accepting monetary donations to cover shipping costs. It plans to accept donated goods this spring, organizers said. Lisa Pflaumer has big goals for her project. "We want to break down the cultural barriers; we're not Christians, Muslims, Arabs, Americans, Sunnis or Shiites. We're all part of the human race. We should be helping them become economically, politically and socially viable." The project started, said Lisa Pflaumer, because "my husband has a kind heart. That's why he was so drawn to" civil affairs. "Since he's been away from our 5-year-old son, this gives him satisfaction, because he's helping out children in that country," she added. "They are the future." Lt. Col. Pflaumer, 42, a scientist with the New Jersey Department of Environmental Protection, has been working to revitalize Iraq's economy. "I'm working at the Baghdad International Airport doing economic revitalization projects and trying to get the airport internationally recertified," he said in an e-mail to a friend. Pflaumer also took a special interest in building relationships with Iraqis. "These people are suffering and even a little gesture can provide them with hope," he told his wife last week during a quick phone conversation. Pflaumer, who is stationed at Camp Victory on the outskirts of Baghdad, spends much of his spare time visiting the medical clinic near the airport in Al Radwaniyah. "I like to go see the kids; they are a lot of fun," Pflaumer wrote in an e-mail to his friend. "We have a doctor in our unit who helps the clinic so I go with him." The desperate needs of the children he met led him to enlist his wife's help in Langhorne. "We're trying to do good for that country, to give people hope for a better future - one built on democracy," said Lisa Pflaumer, a district manager for Arbonne International, a company that sells health and beauty products. She's gotten help from friends. King said he immediately offered his office as a collection point after Lisa Pflaumer sent an e-mail. "She's a Republican and I'm a Democrat, but this is nonpartisan," King said. "We're talking about women and children in need. At the end of the day, we're helping people." At Pflaumer's Newtown church, Jon Hangeland and his wife, Elizabeth Meyers, who chair the church's community outreach group, said monetary donations were being accepted and donations of goods will follow during April. Items that will be needed include baby formula and bottles, nutritional drinks such as Pediasure, new or gently used clothing and shoes, toys, adult vitamins and boxes for shipping. "It's another way to win the war," said McAleese. "It's a husband and wife winning the war." Added Lisa Pflaumer: "We're just helping where there's a need." To donate, contact Lisa Pflaumer and Operation Build Iraqi Hope at 215-290-7190 or at BuildIraqiHope@ yahoo.com. Donations may be dropped off in the lobby of the Middletown Township municipal building, 3 Municipal Way, Langhorne, Pa. 19047, or the office of State Rep. Chris King, 1239 Wood Lane, Langhorne, Pa. 19047. Donated clothing should be modest to conform with cultural requirements. Monetary donations can be made payable to "The Lutheran Church of God's Love" with the note on the check: "Operation Build Iraqi Hope." It should be mailed to the Lutheran Church of God's Love, 791 Newtown-Yardley Rd., Newtown, Pa. 18940. Donations of goods will be accepted at the church in April.